Twenty percent of Germans believe that their current living conditions won't be improved by reforms and only a revolution can reshape society. That's according to a study released by the Free University of Berlin. 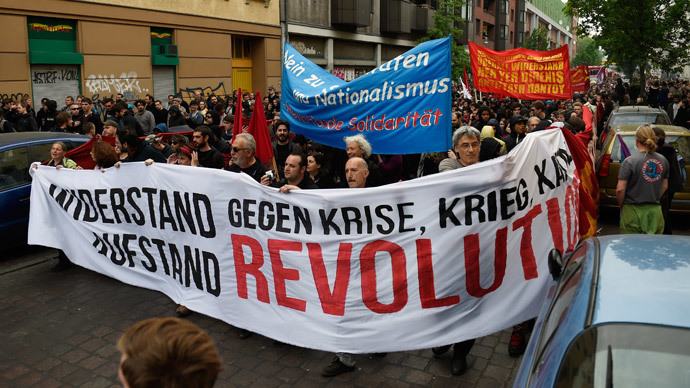 The study, titled "Against the state and capital - to revolution" focused on opposition to capitalism, fascism and racism, and concluded that Germans are more left-wing in their attitudes than previously thought. The challenge for the researchers was to analyze the core structural similarities between right and left-wing extremism. Twenty-five years after the fall of the Berlin Wall, the ideological divide between the former East and West Germany is still marked, with left-wing ideas getting more support in eastern Germany. According to the study, 60 percent of Germans living in the east considered socialism to be a good idea, compared to only 37 percent of residents in the west. Almost 50 percent said they had recently noticed increased surveillance of left-wing dissidents by police and the state, while nearly one-third of Germans fear that by spying on its citizens the country may be sliding toward a dictatorship. The multi-year research project was conducted under the federal program "Democracy initiative strengths." For the representative survey, almost 1,400 people were surveyed by polling firm Infratest Dimap. Twenty percent of respondents said they saw the rise of neo-fascism in Germany as a real danger, while 48 percent said they believe a deep-rooted xenophobia currently exists in Germany. And a majority of Germans – 62 percent – said that German democracy isn't real democracy, because it's economy-driven. Another claim in the study, led by Professor Klaus Schroeder, was that there had been a clear spike in “left-wing violence” in recent years, with police and right-wing extremists being the most common targets. An attack on a Leipzig police station in January may have been an example of this far-left violent protest, Schroeder said. The incident saw 50 hooded people attacking a neighborhood police station, setting fire to a patrol car, throwing rocks, bottles and paint bombs against the security glass. According to police, the attack lasted just less than a minute, before the group dispersed into the darkness. Earlier this month, left-wing activists also appeared to be the main suspects behind the vandalizing of posters for the Hamburg local elections belonging to right-wing party AfD (Alternative for Germany). AfD slogans included: "Stop Islamists" and "Immigration needs strict regulation," the Local reported.